Production (shown in blue in the diagram) is the process by which a human agent expresses their self through first deciding what message s/he wishes to communicate (cognitive level). They then plan and encode the appropriate linguistic utterance to represent the concept (linguistic level) and, finally, produce this utterance through the suitable co-ordination of the vocal apparatus (physiological level). Production is sometimes referred to as expression. Transmission (yellow in the diagram) is the sending of the linguistic utterance through some medium to the recipient. As we are only concerned with oral verbal communication here, there is only one medium of consequence and that is air, i.e. the spoken utterance travels through the medium of air to the recipient’s ear. There are, of course, other media through which a message could be transmitted. For example, written messages may be transmitted with ink and paper. 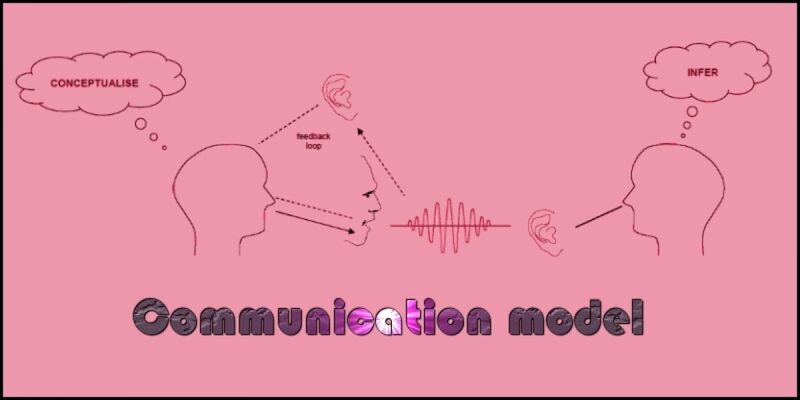 However, because we are only concerned with the transmission of messages that use a so-called vocal-auditory channel then transmission is said to occur at the acoustic level. Reception (green) is the process by which the recipient of a verbal utterance detects the utterance through the sense of hearing (physiological level) and then decodes the linguistic expression (linguistic level). Finally, s/he then infers what is meant by the linguistic expression (cognitive level). So, for example, the listener may first hear the sound sequence ‘d – o – g’. Subsequently, this is decoded and its meaning checked: the listener recognizing this as referring to a domestic mammal related to wolves. Finally, the listener must infer what is meant by the utterance. For example, a child who simply says “dog” may actually mean something like, “Look mummy, there’s a dog in our garden.” However, the totality of this meaning is not encoded linguistically in the single word “dog” but has to be inferred by the listener. Reception is often referred to as comprehension. Let us now look more closely at each of these levels as they operate first for the agent and then the recipient. When two people talk together, the speaker sends messages to the listener in the form of words. The speaker has first to decide what he or she wants to say and then to choose the right words to put together in order to send the message. We do not fully understand how people conceptualize, collect their thoughts and then decide what they want to say. What we do know, however, is that these decisions are taken in a higher level of the brain known as the cortex. Suppose a child wishes to communicate to their mum that they have just seen a furry animal with four legs, whiskers on its face, a tail at its rear and sharp retractable claws. Somehow the child has to encode this idea into a form that is meaningful to mum. In English, the way one does this is to decide upon the word cat. The child has, therefore, encoded a word at the linguistic level. In order to select this word it is necessary that it is stored in the brain. One cannot choose something that it is not available for selection. Each of us has a bank of words stored in our brains – known as our lexicon. It is built up over time and the items we store are different from person to person. The store is largely dependent upon what we have been exposed to, such as the job of work we do, where we have lived, what our interests and hobbies are, and so on. Whenever we need to encode a word we search this lexicon in order to determine whether or not we already have a word for the idea we wish to convey. Having selected an appropriate item from the lexicon it is usual, although not always necessary, to combine this item with other words in order to construct a meaningful utterance. There is a difference between simply uttering the word “cat” and the longer utterance “I have just seen a cat.” All languages have specific rules that dictate which words may be combined with which other words and in what order. These rules are the grammar of the language. Consequently, at the linguistic level, the agent must have access to a lexicon and a set of grammatical rules. Once the linguistic encoding has taken place the brain sends small electrical signals along nerves from the cortex to the mouth, tongue, lips, vocal folds (vocal cords) and the muscles which control breathing to enable us to articulate the word or words needed to communicate our thoughts. To formulate the word cat, you must articulate three sounds. The first is the consonant ‘c’, the second is the vowel ‘a’, and the third is the consonant ‘t’. This production of the sound sequence occurs at what is known as the physiological level and it involves rapid, coordinated, sequential movements of the vocal apparatus (breathing mechanism, larynx, and vocal tract). Through sensory signals from the nerves that supply the surfaces of the tongue, lips, palate and other parts of the vocal apparatus. The transmission of signals through the nervous system allows the speaker to monitor, for example, where the various parts of the vocal apparatus are in 3-D space in relation to each other. This is known as proprioceptive feedback. Through auditory feedback. As we speak we are continually listening for any errors in our production and making the necessary modifications. This is arguably the more important of the two types of feedback, as a hearing impairment can often lead to communication problems. When the speaker’s utterance (transmitted acoustically as a speech sound wave) arrives at the listener’s ear it causes his or her eardrum to vibrate. This, in turn, causes the movement of three small bones within the middle ear. Their function is to amplify the vibration of the sound wave. One of these bones, the stapes, is connected to a membrane in the wall of nerve bundle called the cochlea. The cochlea is designed to convert the vibrations into electrical signals. These are subsequently transmitted along the 30,000 or so fibers that constitute the auditory nerve to the brain of the listener. Again, this takes place at the physiological level. The listener subsequently decodes these electrical impulses in the cortex and reforms them into the word or words of the message, again at the linguistic level. If the incoming signals are decoded into the single word “cat”, for example, the listener compares this with other words in his or her own lexicon. The listener is then able to determine that the word is a proper word and that it represents, in this example, the concept of a furry (domesticated) animal with four legs, whiskers on its face, a tail at its rear and sharp retractable claws. In order for a recipient to decode longer utterances and to interpret them as meaningful, he or she must also make use of the grammatical rules stored in the brain. These allow the recipient to decode an utterance such as “I have just seen a cat” as indicating that the event took place in the recent past, as opposed to an utterance such as “I will be seeing a cat” which grammatically indicates that the event has not yet happened but will happen some time in the future. Consequently, as with the agent, the recipient also needs access to a lexicon and a set of grammatical rules in order to comprehend verbal utterances. It is at this level that the listener must infer the speaker’s meaning. Let me explain what this means. Suppose that you are at a train station and you overhear a passenger standing on the platform say to another, “It’s gone.” What do you understand to be the meaning of this utterance? Is the speaker referring to a train that has left the station? If so, then the meaning of “It’s gone” might be the train has left the station. But what if this interaction occurred on a hot day and a wasp had flown at one of the passengers and had been buzzing around their head. Perhaps the “It’s gone” was intended as a remark to the unfortunate passenger that signalled the wasp that was just this moment buzzing around your head has now flown away and you need no longer be afraid. The point is that a linguistic utterance can never convey all of a speaker’s intended meaning. At best, a linguistic utterance is a sketch and the listener must fill in the sketch by inferring the meaning from such things as body language, shared knowledge, tone of voice, and so on. Humans must, therefore, be able to infer meanings in order to communicate fully. The agent and recipient are, of course, linked through the acoustic level. The movements of the speaker’s vocal apparatus produce changes in the surrounding air. The atoms that compose the air are rhythmically disturbed and each atom bumps into an adjacent one, which in turn bumps into the next one, creating what is known as a speech sound wave. This radiates through the air from the speaker’s mouth to the ear of the listener. The speech sound wave occurs at the acoustic level. Transmission models are frequently criticized on the grounds that they do not emphasize the interactive nature of human communication. Communication is a reciprocal social activity, with the roles of agent and recipient constantly alternating. At one moment I may be the agent who is instigating a verbal utterance. Upon completion of the utterance, however, I may then become the recipient, as the former recipient takes on the role of agent and responds verbally to my immediately prior utterance. There is a constant interplay between the participants, with each taking turns at either instigating a verbal utterance or acting as an attentive recipient. The participants act as both encoders of linguistic meaning and decoders of linguistic sound, constantly interpreting and reinterpreting the messages.